Yes, there is such a thing as Deep-Fried Cheesecake and it happens to be super easy to make with results that will blow you away. Small flour tortillas are wrapped with a creamy sweet cheesecake filling and fried until crisp, then coated in a sugar-cinnamon mixture that just tops everything off so well!The idea is brilliant and quite impressive if you ask me. These amazing desserts also go by the name of “Cheesecake Chimichangas,” which is a kind of deep-fried burrito. Flour tortillas fry up beautifully and the cheesecake filling is just awesome. The sugar coating is kind of like the crunchy crust of a cheesecake that adds the perfect coarse texture to these tasty dessert sticks. Dip in some homemade strawberry jam and you have one impressive dessert! 1. In a large bowl beat the cream cheese until creamy. Then add in 1/4 cup of sugar, vanilla extract and sour cream and mix until well combined. 3. 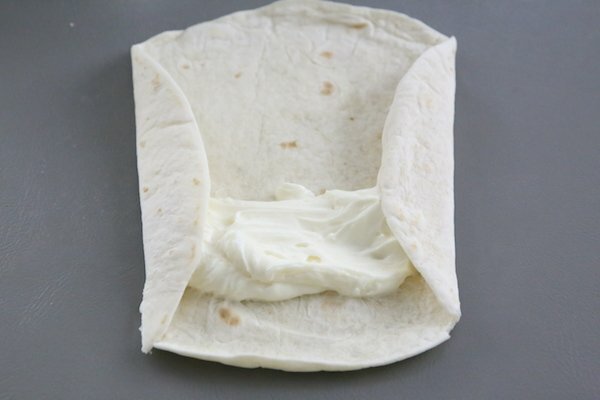 Spread about 2 tbsp of the cream cheese filling onto the lower half of the tortilla. Fold in the sides and roll upwards sealing the end with a toothpick. Freeze for 30 minutes. 4. Place the sugar coating into a large zip-loc bag and toss to combine. Set aside. 5. Pre-heat 1 cup of oil in a medium sized saucepan over med-low heat. 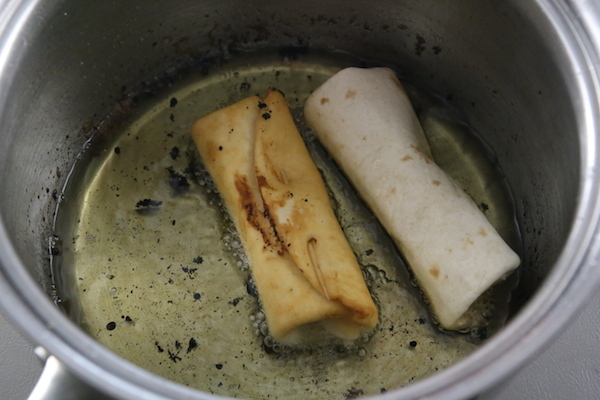 Fry cheesecake sticks for about 2 minutes on each side or until golden. And immediately dredge in the sugar coating. Yes, there is such a thing as Deep-Fried Cheesecake and it happens to be super easy to make with results that will blow you away. 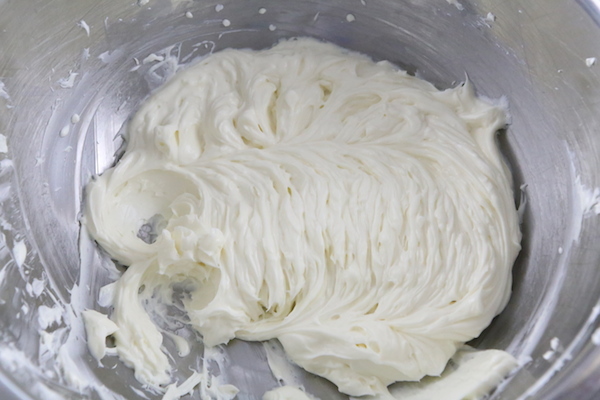 In a large bowl beat the cream cheese until creamy. Then add in 1/4 cup of sugar, vanilla extract and sour cream and mix until well combined. Spread about 2 tbsp of the cream cheese filling onto the lower half of the tortilla. Fold in the sides and roll upwards sealing the end with a toothpick. Freeze for 30 minutes. Place the sugar coating into a large zip-loc bag and toss to combine. Set aside. Pre-heat 1 cup of oil in a medium sized saucepan over med-low heat. 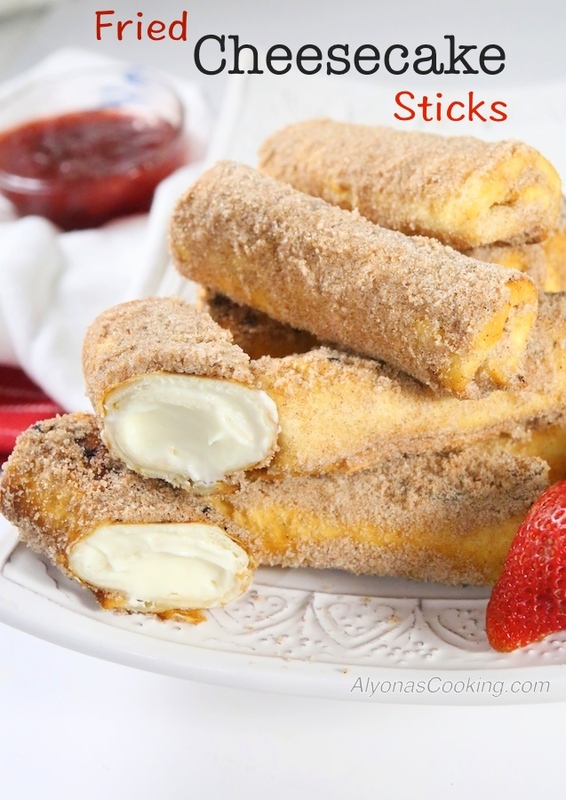 Fry cheesecake sticks for about 2 minutes on each side or until golden. And immediately dredge in the sugar coating. Hi, could you see how can I get that thick sugar coating at the end. Mine are not so thick as shown in the pic. 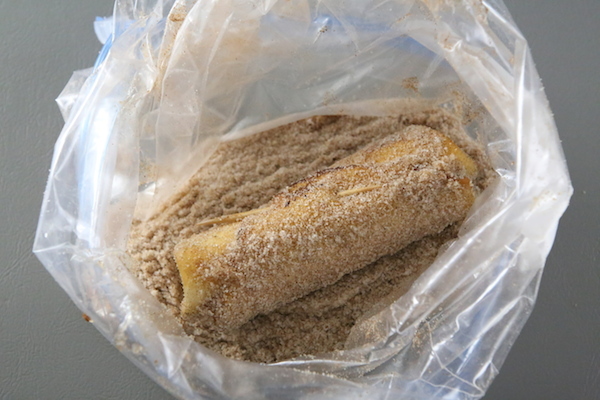 Can these cheesecake sticks be frozen and stored for later use? If so, for how long? 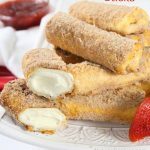 Perhaps these could be freezer friendly, I personally never tried freezing chimichangas but maybe if you partially deep fry them, cool and freeze them, then maybe they can just be toasted up in the oven from the freezer.